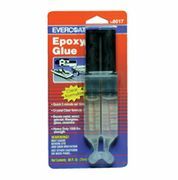 Crystal clear liquid formula is great for the small jobs demanding an epoxy. Sets in five minutes and has full 1,500 lb. strength in one hour. No measuring needed. The plunger dispenses the correct 1:1 ratio every time. Mini stir stick included for mixing. Marine formula resists water, brine, sun, chemicals and fuels. Bonds to wood, metal, glass, fiberglass, gelcoat, ceramics and most plastics.